Also, the box office in general has had sequel fever lately, and while there is a certain charm to seeing the same beloved characters reappearing again and again, I am definitely experiencing sequel/superhero fatigue on a large scale. So to say I was nervous about The Incredibles 2 is an understatement. But I figured with director Brad Bird at the helm once more, it couldn't be all bad. that sets the familial theme for the feature film. I find it perplexing the negative reaction by so many to this lovely piece of art, the first short to be directed by a woman, Domee Shi. The story tells of a Chinese family in Canada, whose mother is experiencing some serious empty-nest vibes. She is delighted when, quirkily enough, once of her dumplings - a "bao" in Chinese - comes alive as a small, angsty baby. 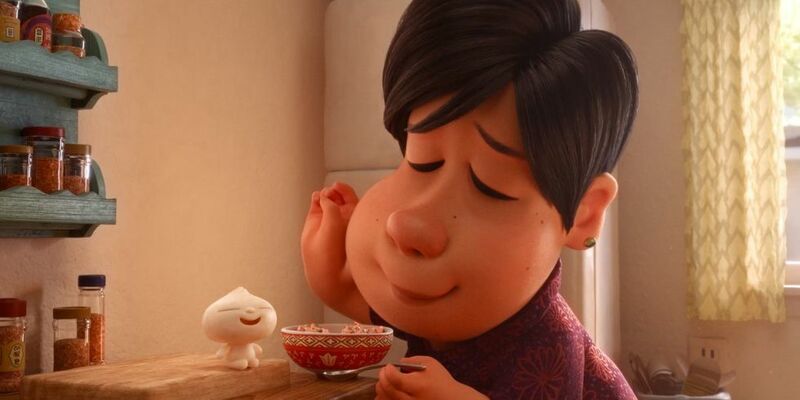 We see her raise the dumpling as her own over the course of a few short minutes, an exquisitely carved miniature of the journey of motherhood in all its stress and glory. When the twist comes - enough of one to render a gasp from the audience around me - the resolution is swift and heartfelt. Perhaps it is my background from living in Hong Kong the last year and a half or so, but everything about the piece and the inner workings of the family made perfect sense to me. The reception of the short by the audience I was sitting with in Hong Kong was generally favorable rather than bewildering, which may show that it spoke more directly to cultural familiarity than it would to American audiences. Regardless, it is a brave piece that gently reminds families the importance of letting go and accepting of new members (e.g. spouses) that may have a vastly different cultural background from them; for they often have special things to give and teach as well. "Bao" creates a unique cultural experience - in 7 minutes! Onto the main attraction. First, visuals - I was gratified to see that the quality of the animation was not vastly different from the original. It has been 14 years since The Incredibles appeared in theatres, and I worried the extensive advances in digital animation would render it too slick and smooth; creating a further wedge between the two films. But Bird clearly kept this in mind. While the bold colors and textures are much richer, the characters essentially have the same look and feel to them. The same kind of minimalist Frank Lloyd Wright-style of architecture and vibe that Bird so often favors in his films is heavily present once again, and it reflects the tightly woven, fast-paced plot. Expert cuts balance screen time evenly between Bob Parr's stint as a stay-at-home Dad and Helen Parr (aka: Elastigirl's) return to the spotlight as part of a campaign to bring back the "Supers". Further continuity is solidified in Giacchino's bouncy, brass-heavy score, reminiscent of the 1960s theme music that so much of the film's aesthetic takes inspiration from. While the film comments, it doesn't criticize. In the world of cinema where the preference is often to tell instead of show, to judge instead of ask, Bird creates a story that allows the audience to come to their own conclusions. The cleverly named "Screenslaver" villain could be a comment on how we as a society are too dependent on our various electronic devices, but people being hypnotized by items they already own succeeds in being less of a statement and more of an interesting device to move the plot along in a suspenseful way. The themes of female empowerment are effective without being anti-men. Bob Parr (aka: Mr. Incredible) is understandably hurt when his Super persona is set aside in favor of his wife's in the campaign to make the Supers legal again. And let's be fair - the first movie was mostly about Mr. Incredible, so it is good to see Helen in the spotlight this go-round. The banter between Helen and Bob as he agrees to take over childcare and domestic chores on the home front feels authentic; genuine. The genius of Brad Bird is that he treats his characters as flesh and blood, relatable humans, even though they are made of pixels. Audiences even get to see a little more of the human side Edna Mode - the snooty fashion designer for the Supers voiced by Bird himself - when in a desperate stab at a chance for sleep, Bob drops off Jack-Jack at her deluxe mansion for baby-sitting - and against all odds, baby and fashion guru instantly fall in love with each other in a bemusing turn of events. And there's plenty of relatability for the younger audience members - Jack-Jack's super-fight with an invading racoon is broad, slap-stick humor that will appeal to teenies, Violet has her share of angsty teenage drama all the while managing her newly found self-esteem, and Dash is his usual, feisty energetic self. Some adult members of the audience could be heard sighing sympathetically with Bob has he finally breaks down to call his old buddy Lucius (AKA: Frozone) for some help with juggling the three kids in Helen's extended absence. Buoying the energy are cuts to Helen on her new mission, and getting the opportunity to see her "stretch" her wings in multiple creative ways and reaffirm her badassery is definitely worth the price of admission. The only true tedium is the seemingly endless array of powers Jack-Jack displays; which just when one thinks they are beginning to have a pattern of manageability, something new shows up that the beleaguered family has to contend with. I imagine this was a comment on Bird's part to the unpredictability of babies, but from my point of view, it seemed an unusually haphazard decision amidst such a tightly organized storyboard. For the diehard fans of the original, there are callbacks aplenty. At one point while helping Dash with his homework, I spied an "Insuracare" mug on the desk next to Bob. Helen's piloting skills once again play a key role in the plot. The villain reveal was a bit too obvious for me, and the motives for the "Screenslaver" weren't entirely made clear other than the blanket reason of "Supers are no good." But still, the film has a satisfying conclusion, leaving us back in a similar spot as the first, with an evolving family learning and growing together to manage their revolving doors of the mundane and the remarkable. Stripped down to its essence, The Incredibles a heartfelt testament to the importance of parents working together as a team on behalf of their family, setting egos and stereotypes aside to allow for more possibilities and (pun intended) flexibility. Critic Kitty Batman sez: A fun and ultimately relatable flick, Incredibles 2 delivers a worthy second installment with a well-balanced plot that will delight a wide range of ages. It pays homage to the glory of the original rather than trying to overshadow it.